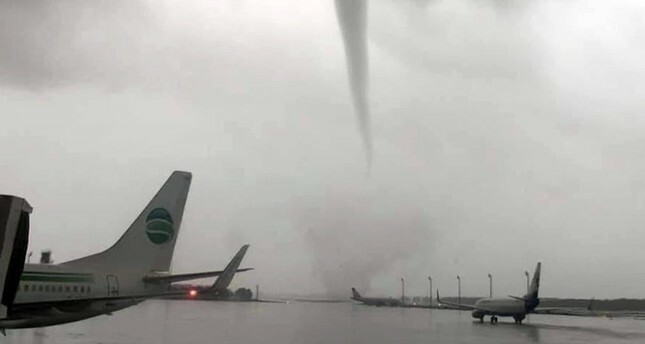 The fifth tornado in four days struck Turkey's southern Antalya province Saturday, flipping buses and causing damage to planes and the city's international airport. After a rough evening, authorities said 12 people had been injured, two buses and a minibus had overturned and two sets of airstairs had toppled over due to high winds. Speaking to Turkish news channel NTV, Antalya Governor Münir Karaloğlu said that two planes and a police helicopter had suffered significant damage in the storm. He stated that none of the injured were in critical condition. He said authorities are surveying the damage and doing their best to clean up the airport to avoid further delays. Meanwhile Environment and Urbanization Minister Murat Kurum said 229 buildings had sustained damage in the powerful storm and tornadoes. Energy and Natural Resources Minister Fatih Dönmez said that the freak weather had also caused major damage to 140 transformer stations in Antalya, adding that power will be restored to most households by the end of the day. Governor Karaloğlu said he hoped the worst was over and the destructive winds had passed, adding that air traffic was now back to normal. However, he urged precaution and advised citizens to closely follow the General Directorate of Meteorology's announcements and monitor the weather. Downed trees blocked roads and there were power cuts in parts of central Antalya, Karaloğlu said, warning that the bad weather was expected to continue until Sunday. The powerful storm started Wednesday night, hitting Antalya's Kumluca, Kemer and Finike districts and damaging buildings, agricultural areas, and vehicles.